The 2-cent piece occupies an interesting position among all US coins for the collector. With production beginning during a severe circulating coin shortage, it was initially well received, but as other denominations of coinage made their appearances, the 2-cent piece quickly fell out of favor. This short-lived series offers the opportunity to collect in a number of ways. With a ten year circulation strike production span, and a plentiful supply, the collector can opt to pursue completing a set in just about any grade they choose. While the higher grade examples can become quite costly, most collectors will find that quality extremely-fine to almost uncirculated examples are readily available at affordable prices. Collectors can choose to pursue high grade circulation strike or Proof strike samples of the coins as well, but they should be aware that coins from the later years of the series can quickly become quite expensive. Thus, as a short-lived series, a year set can be completed much more easily than other longer term issue denominations. The series can offer error collectors a wide variety of issues to choose from. The Cherrypickers’ Guide details a total of twenty-one different error and varieties for this short series. Over thirty varieties and errors are documented for the year 1864 alone in Kevin Flynn’s book Getting Your Two Cents Worth. The 2-cent piece was first suggested in 1806 in legislation offered by Senator Uriah Tracy of Connecticut. His bill suggested a silver composite 20-cent piece and a 2-cent piece of billon (90% copper/10% silver). After passage by the Senate, Mint Director Robert Patterson, LLD, (served January 1806–July 1824) was successful in defeating the bill in the House of Representatives. Not to be deterred, Senator Tracy made another attempt in early 1807. However, the influence of Director Patterson prevailed in the House of Representatives once again. In January of 1816 Representative Erastus Root of New York introduced legislation suggesting a 2-cent piece. Opposition from the Treasury Department and the Mint was enough to prevent passage of the bill. Another attempt was mounted in 1836 with likewise negative results due to the opposition of the Mint Director Robert Maskell Patterson, M.D., (served May 1835–July 1851) whose father, as Mint Director, had ended the earlier attempts. This effort was accompanied by several pattern coins struck in billon, and in copper. Surviving examples are identified as Judd 52 and Judd 54. 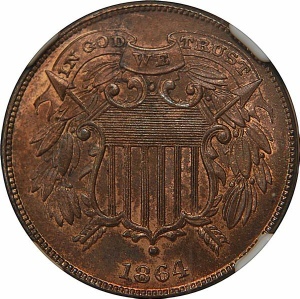 In late 1862, and through 1863, the Mint was unable to meet demand for the new small copper-nickel cents due to wartime hoarding and the lack of a 5-cent piece in circulation to support commerce. In December 1863 Mint Director James Pollock suggested a 2-cent coin be produced, in bronze, in an attempt to supply much needed minor coinage for circulation. Patterns were ordered struck that have been identified as Judd 305, 306, 308, 312, and 312a. These patterns were produced in a variety of metals and designs. The bronze Judd 312 and 312a most closely resemble the design implemented in 1864. Treasury Secretary Chase requested that the motto of God Our Trust be changed to In God We Trust. Congressional approval was included in the Mint Act of 1864, approved by Congress on April 22, 1864. Disagreement exists about the first year mintage totals. According to R.W. Julian: “The correct mintage of 2-cent pieces in 1864 was 19,822,500, not the currently accepted figure of 25,000 more.” He attributes the discrepancy to an error in 1886 when calendar year figures were calculated. Current Red Book editions report mintage as 19,847,500. Production began utilizing a pattern die that had the small lettering in the In God We Trust motto. The balance of 1864 production and all subsequent years used larger motto lettering as well as exhibiting other less noticeable changes. The Proof production of this first year is estimated at 100 pieces, with about 20 known to be of the Small Motto variety. In his book The Two Cent Piece and Varieties, Myron M. Kliman estimates the survival rate of Proof strike 2-cent pieces at 62½ percent. This would mean that of the estimated 100 Proof pieces produced in 1864 (less the known Small Motto examples), approximately a mere 42 Proof examples remain of the Large Motto. Thus, any Proof production examples are highly prized. A total of 45,601,000 circulation strike and 7,160 Proof 2-cent pieces were minted between 1864 and 1873. 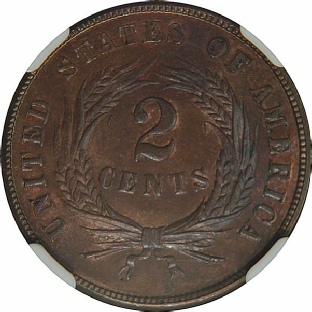 Designed by James Barton Longacre, the 2-cent piece met with initial popularity, but demand soon fell to the point that production was discontinued. With Longacre’s death in 1869 a new Chief Engraver, William Barber, took over the Mint’s design duties. Barber modified the master hub by reducing the size of the berries along, with other small changes. The coins struck from 1870 to 1873 show these changes. The Open 3/Closed 3 variety’s, are seen on a number of other coins of 1873 as well. The gold Double Eagle, Half Eagle, Three Dollar, Quarter Eagle and One Dollar; along with the Quarter Dollar, Half Dime, Shield Nickel, Three Cent Nickel, and Indian Head Cent denominations all exhibit the Open 3/Closed 3 variety. All of these Open 3 varieties are accepted to have been produced in 1873 so the idea that the Open 3 variety two-cent pieces were also produced in 1873 would be consistent with mint production records for the other denominations. Between 1871 and 1881 a total of 17,557,941 2-cent pieces, both circulation strikes and Proof strikes were redeemed and melted by the mint. Unfortunately no records were kept by coin dates. This would mean that a total of 28,050,219 pieces likely survived redemption and destruction. 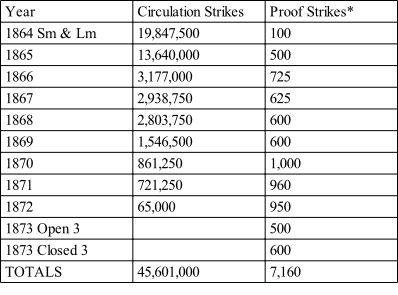 Considering the previously noted estimated survival rate of Proof strike 2-cent pieces to be 62.5%, this would mean that of the 7,160 Proof struck pieces produced, 4,475 pieces remained in with collectors (or in circulation) from all years. This biggest impact on the survival rate of Proof coins would be on the first year of production. With 100 estimated Proof mintage, and assuming 62 or so survive, then factor in the approximately 20 known to be the small motto variety, the remaining coins are difficult to obtain. Building your set of two-cent pieces will most likely depend on finding an example of the two or three more difficult pieces. Specifically, the 1872 and the 1864 Small Motto are the most difficult to locate. In grades MS-63 or MS-64 recent sales of the Small Motto were in the neighborhood of $1,300 to $2,400. Availability of the 1864 Small Motto and the 1872 year are more frequent in non-MS grades, with the plus of greatly lowered prices. If Proof struck pieces are your goal, the few known Small Motto 1864s rarely are available, and if they appear on the market spirited bidding will most like drive prices above $30,000. Also difficult to locate are Proof stuck examples of both the Open and Closed 3 of 1873. While values of collectible two-cent pieces continue to rise, with especially choice pieces selling at auction for thousands of dollars apiece, today’s collector is still able to assemble a set in any of a number of grades. A look at the values of individual years shows that in recent years sharp increased are noted. A Fine-12 example of an 1864 Large Motto was priced at $6.00 in the 1988 Red Book, in 1998 it rose to $15.00, and today the value is listed at $25.00. The same coin in Extremely Fine-40 condition was valued at $30.00 in 1988, stayed at $30.00 in 1998, and in 2010 had risen to $45.00. An interesting anomaly is noted for a MS-63 grade coin in that the 1988 value was listed at $400, the 1998 value at $140, and in 2010 had recovered a bit to $150. In the 2010 edition of the Red Book a ten piece set of 2-cent pieces in Fine-12 condition is valued at $894. The same set in Extremely Fine-40 grade totals $1,830. The jump to MS-63 grade results in the total rising to $5,105. As noted previously, Proof struck examples bring high prices. The 2010 Red Book total for such a set, less the 1864 Small Motto, of course, is $9,625. While generally accepted as reflecting high retail pricing, in this case the current Red Book Professional Edition lists an eleven piece set, again less the Small Motto, in Proof-64 Brown at a total of $11,200. Having pursued such a set for a number of years, it is my opinion that the values listed may in fact under estimate the actual market acquisition cost by as much as 30%. The U.S. Two Cent piece is an interesting series to collect. It is rich with history. And it holds a unique position in the collecting market place. When will you start your set? Flynn, Kevin, Getting Your Two Cents Worth, Rancocas, NJ: Kevin Flynn, 1994. Julian, R.W., “All About the Two Cents,” The Numismatist, vol 122 no. 12, December 2009. Kliman, Mryon M., The Two Cent Piece and Varieties, South Laguna: Myron Kliman, 1977; and New York: Sanford Durst, 1983. Yeoman, R.S. and Kenneth Bressett, A Guide Book of United States Coins, Atlanta: Whitman Publishing, annual since 1946. Yeoman, R.S. and Kenneth Bressett, Jeff Garrett, and Q. David Bowers, A Guide Book of United States Coins-Professional Edition, Atlanta: Whitman Publishing, 2009.